Oral-B 3D White Luxe Glamorous White Toothpaste - Product of the Year Winner 2018. Whitening Toothpaste Category. Survey of 10,637 people in UK and ROI by Kantar TS. 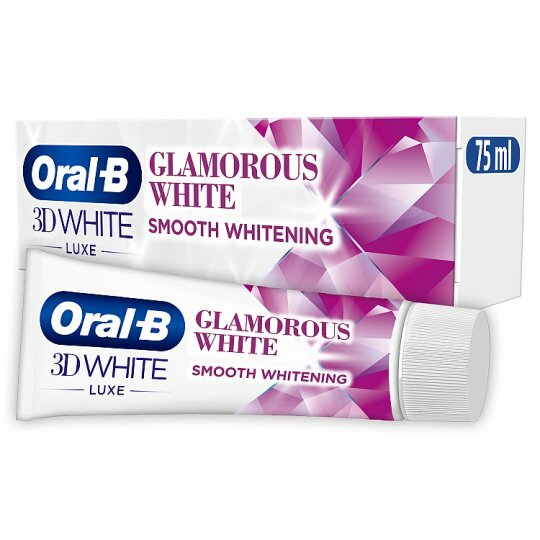 Trust your mouth to the whitening expertise of Oral-B 3D White Luxe Glamorous White toothpaste. The innovative enamel-safe formula enhances the beauty of your smile by using stain dissolving particles to remove up to 100% of surface stains in 3 days. The exclusive Oral-B formula also helps prevent future stains, to maintain your glamorous smile! Plus, the refreshing mint flavour leaves your breath with freshness that lasts. Dentists recommend to brush your teeth 2 minutes at least twice a day. Children of 6 years and younger: Use a pea sized amount for supervised brushing to minimize swallowing. In case of intake of fluoride from other sources consult a dentist or doctor. Contains Sodium Fluoride (0.243%) (1100 ppmF).